Happy Sunday! I had a few ideas in mind when I saw today's CPS Sketch - but settled with this creation. If I have time later this week, I'll post another card idea using this sketch - sometimes if I don't get the idea out of my head and on to paper it'll drive me nuts until I do. To create this card, I used Colorwash Batik Technique. Using Direct to Stencil, I applied my White Craft ink to the Kind Thoughts Flourish Stencil, then clear embossed. I made my own Color Wash Spray, using a small mister bottle filled with water, about 10 drops of Regal Rose reinker, and a drop of alcohol. Not as intense are store bought sprays, but does the job for a SUO card. Once the card stock was dry, I rolled my Friendly Words Wheel in Chocolate, then placed clear copy paper over my flourish and ironed off the embossing powder with my Craft Iron. 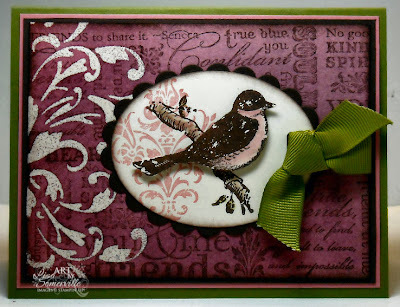 The bird from Friends 24-7 is stamped in Chocolate twice (cut one out to pop over image)- the damask image is stamped in Regal Rose. The Vanilla card stock is cut with the Oval Nestabilities, layered on a Scallop Chocolate Oval. Color was added to the bird and branch with an Aquapainter and ink pads. I think I say this with all of your cards but I have the same reaction everytime I come: WOW!! This is GORGEOUS!! oh lisa lisa lisa. this is soooo gorgeous! really, really pretty. thanks for posting it! Wowie on the amazing techniques you used here! LOVE the colors and that bird is just beautiful. Great use of the CPS sketch. the technique you used is stunning! You have amazing talent! This is beautiful, Lisa! I love how the background turned out. LOVE this card! I had heard about the colorwash technique but did not know how to do it. Now I will have to try it. Thanks for the inspiration! What a juicy and delightful card! It's my first visit to your site, via the CPS challenge: great work! Your blog is wonderful!